Members of the Chelsea Chamber of Commerce joined local residents in paying tribute to well-known local businesswoman and Chamber board member Joanne Tarason at observances this week. Mrs. Tarason Washington Ave., died unexpectedly on Feb. 19. She was the owner of Coprico Printing, 40 Washington Ave., for many years. Susan Gallant, vice president of the Chamber of Commerce, said the local business organization could always count on Mrs. Tarason to help out at events. The Suffolk County Land Court has remanded the controversial Zoning Board affordable housing denial on Broadway back to the Chelsea Zoning Board of Appeals (ZBA) with a revised plan. The combination of The Neighborhood Developers (TND) and Traggorth Development went before the ZBA last year with a project slated for 1005 Broadway – a mostly affordable housing development. 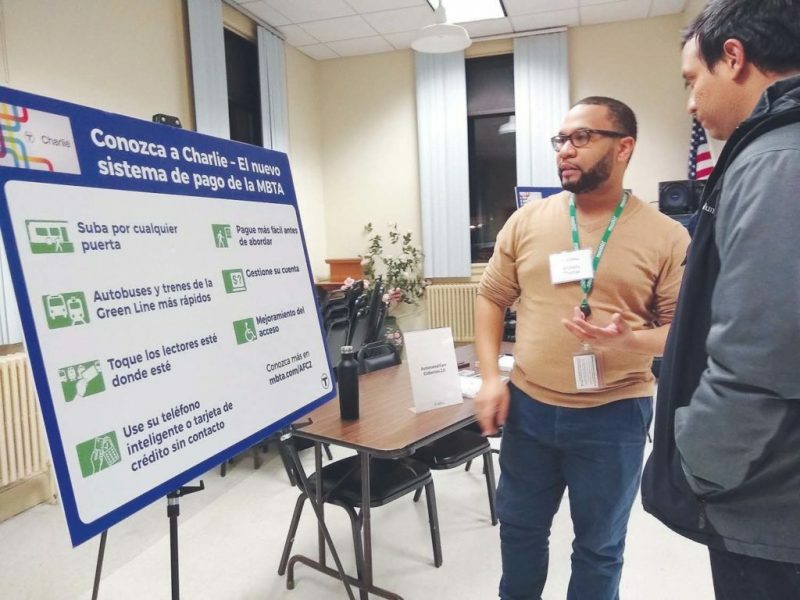 However, shockingly for many, it was denied in a close vote as community members called for a revised project with more home ownership opportunities. The developers appealed that denial, and now Land Court has sent a revised plan back to the ZBA for consideration next month. The new proposal has eliminated the commercial component, reduced the height on Broadway from five- to four-stories. The unit count is also down from 42 to 38. This time, all 38 units will be affordable apartments for rent. City Attorney Cheryl Fisher Watson said the developers and ZBA placed the matter on hold during the appeal. City Manager Tom Ambrosino said he would be supporting the revised project. St. Stanislaus Church has submitted a petition with dozens of signatures requesting that the City not leave the temporary direction change on Chestnut Street intact. “This change has been detrimental to the day-to-day business operations of the Parish rectory, prohibits our elderly parishioners from entering and exiting their vehicles in a safe manner, prevents the safe loading and unloading of supplies to both the rectory and the church, disrupts the motor vehicle processional for funerals, impedes workers coming make repairs and service calls to the Church and rectory and causes an increase of noise during our solemn services due to the excessive congestion of traffic,” read the letter accompanying the petition, which was presented to the City Council and Traffic Commission. Chestnut Street has long had an odd configuration at Fourth Street, with no one able to turn in either direction coming off the Mystic/Tobin Bridge exit. Both sides empty onto Fourth Street. However, during construction on the Beacon Street off-ramp, Chestnut was made one way all the way from City Hall to Everett Avenue – one long stretch. It became popular with many drivers, but especially the Police and Fire Departments. 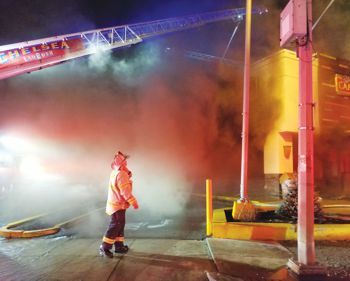 Fire officials said they felt it helped response times from Central Fire in getting to Everett Avenue. A petition to make the temporary change into a permanent change is now before the Traffic Commission and City Council. Count St. Stan’s against it. Members of the Chelsea High School Class of 2019 are a step closer to getting their wish of an outdoor graduation on the new high school field. City Manager Tom Ambrosino is requesting the City Council approve spending $170,000 from the City’s Stabilization Account to buy a protective mat for the new turf field at the high school. “This removable, plastic covering will allow for greater use of the field for non-sporting events, including allowing for an outdoor graduation for the Chelsea High School Class of 2019,” Ambrosino stated in a letter to the Council. The city is in the midst of a $3 million-plus upgrade of Veterans Field at Chelsea High School. The first phase of the project, replacement of the artificial turf and the new track, is scheduled for completion this fall, according to Ambrosino. A second phase involving lighting and restrooms will continue in the spring. The new turf field comes with an eight-year warranty, but that warranty is voided if certain uses occur on the field, including large static crowds, spiked heels, or chairs with four legs. The City Manager said these restrictions would all but eliminate the use of the surface for any non-sporting events. At the request of the school, Ambrosino is asking the Council to approve the additional funding through the School Capital Stabilization Account, which Ambrosino said was specifically established for these types of School Department capital expenditures. At its Monday night meeting, the council voted to take up the issue in its Finance Subcommittee. The request from the City Manager was good news for Chelsea High Senior Manuel Teshe, who addressed the Council earlier this month about senior class fundraising efforts to secure an outdoor graduation. Prior to hearing from Ambrosino, Councillors Ray Avellaneda, Leo Robinson, and Yamir Rodriguez introduced an order asking the City Manager to explore the purchase of an event decking system. After hearing about Ambrosino’s request to use the stabilization funds for the purchase, Avellaneda withdrew the order.